A chance to meet one of the club's legends at the legendary Anfield, home of Liverpool Football Club. A former player (John Aldridge, Ian Callaghan, Terry McDermott, Jan Molby, Phil Neal or Phil Thompson) will share their memories of the beautiful game. At the end of the talk there is a chance for questions, autographs and photos. Then pick up a multimedia guide and take the tour from main stand. It goes through the player's lounge and dressing rooms, everyone heads through the tunnel and has the chance to sit in Klopp's seat. 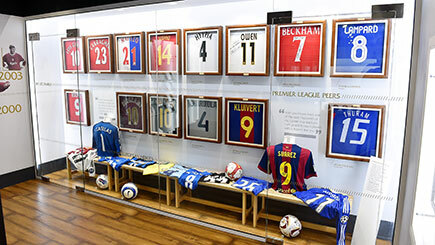 The Steven Gerrard collection with the former captain's personal collection of shirts, medals, trophies and awards is a must see. Join in, Kop end, to a rendition of 'You'll Never Walk Alone', it's a fan's dream come true.